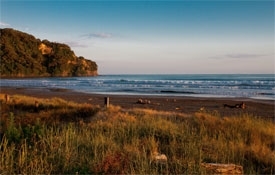 We are only 800 metres to Ohope's restaurants and shops, across the road from one of New Zealand's best beaches and only metres from walking tracks across the hill to Whakatane. Surfs Reach Motels is perfectly situated for a tropical holiday, yet secluded at the same time. The perfect holiday destination. 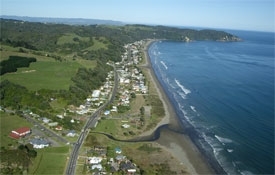 The magnificent golden sand beach at Ohope stretches for 11km and offers safe swimming and surfing. Ohiwa passage is great for windsurfing, and sheltered Ohiwa Harbour provides perfect conditions for fishing and water skiing. 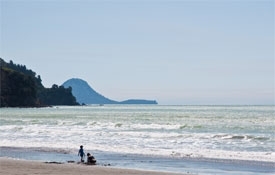 Otarawairere Bay is a great place for snorkelling. Views can be obtained from the Puketapu (Sacred Hill) Lookout, Nga Tapuwae o Toi Pa (perhaps New Zealand's oldest pa), and a track over the western headland. Take a spectacular flight to White Island, a continuously active volcano, where you can land and experience the rare environment.